Gov. Robert McDonell (R-VA) remains a strong supporter of off shore drilling. The April 20 oil spill in the Gulf of Mexico may have spread beyond American shores and into its political landscape as well. Less than a month after President Barack Obama announced that he will lift the moratorium on off shore oil drilling in certain federally protected waters, the accident in Louisiana may have served as a “game changer” for that policy shift. The White House announced on Friday that they will freeze off shore drilling expansion pending an investigation into the cause of the Louisiana spill. Virginian politicians, representatives from the State where the moratorium lift was expected to commence, have mixed feelings about slowing down off shore exploration. Gov. 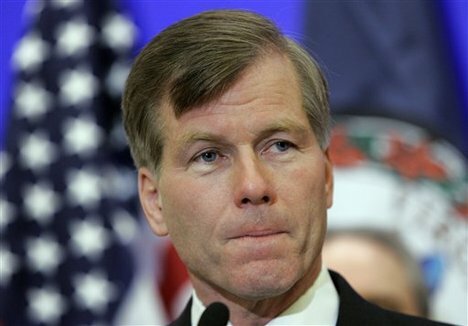 Robert F. McDonnell (R-VA), who labeled off shore drilling as one of his administrations primary objectives during his campaign, remains resolute in lobbying for oil and natural gas drilling. McDonell would like to see drilling commence next year or by 2012 at the latest. Other Virginian representatives seemed more cautious in the wake of recent events. Virginia Beach Mayor Will Sessoms seems like he is doing an about-face on off shore drilling. “It’s alarming to me,” Sessoms said. “It gives me great concern,” he added, while noting that the spill served as a wake-up call and that drilling plans should be put on hold. In the past, Sessoms had supported drilling. Hoping to boost the city’s tourism industry by pushing down gas prices, Sessoms helped the city pass a resolution in favor of drilling. Sens. Mark Warner (D-VA) and James Webb (D-VA) are taking the White House’s wait-and-see approach. Warner’s spokesman Kevin Hall said that Obama’s delay was “appropriate”. Similarly Webb stated that “the facts must be ascertained to determine how the disaster off the Gulf Coast could have been prevented” according to his spokeswoman Jessica Smith. Congressman James Moran (D-VA) is concerned that, similar to the Gulf of Mexico episode, expanded off shore drilling may lead to tragic results for Virginia's wildlife. Environmentalists are using the oil spill as a rallying cry against expanded off shore drilling. Congressman James Moran, (D-VA), chairman of the appropriations subcommittee for the interior and environment, wrote a letter to Interior Secretary Ken Salazar, urging him to reconsider allowing offshore drilling. “Regardless of ideology, this situation should give everyone pause regarding expansion of offshore drilling,” Moran said. “Virginia’s fishing and coastal tourism industries are vital to the Commonwealth’s economy. Should exploration off Virginia’s coast result in a similar disaster, the impact would be devastating to our economy and coastal communities’ way of life,” Moran said in a public statement.